Women must not allow men to hold up perceived female failures such as Marissa Mayer as proof women are not up to business leadership roles, according to a Women4Tech panel at Mobile World Congress. The panel of senior female leaders and investors argued more must be done to address the paucity of women in senior leadership roles, particularly within the technology sector. Terri Mead, angel investor at Sand Hill Angels, believes negative media coverage about Marissa Mayer's tenure at the helm of Yahoo and the dramatic fall from grace of Theranos founder Elizabeth Holmes must not be used against other women in business. Mead said: "We must make sure that we don’t put forward the Elizabeth Holmes’ and the Marissa Meyer’s of the world as examples and allow the general population of men to say ‘see women can’t do it’. "They were seen as failures on behalf of women and not just with the specific situations. In the case of Marissa Mayer with Yahoo if a man had gone in there a man would have been unsuccessful as well." Mead also drew attention to the case of the Uber software engineer making allegations of being sexually harassed at Uber. She said: "The more we put pressure on some of these senior and well respected leaders to try and make changes and the more they talk to their ‘bro network’ then hopefully we are going to be able to push for some more awareness and change." Radhika Iyengar-Emens, managing partner at management consultancy DoubleNova Group, believes more positive female role models are needed to encourage other women. She argues this will be helped by more women taking a role in investment. Iyengar-Emens said: "I would like to see more women investing, when you see women invest and in investment roles then women entrepreneurs know there is someone on the other side who looks like them or sounds like them." Anna Boffetta, associate at venture capital firm Balderton Capital, highlighted the paucity of female tech entrepreneurs in industry. Research from Balderton Capital has found that only 6% of tech founders in Euorpe are women. In a rallying cry to the women in the audience Sabeen Ali, founder and chief executive at hackathon firm Angelhack, said "your voice is the voice that is missing from the tech industry and it is a huge disservice not only to yourself but to everyone else". She said: "We [women] are the primary consumers but we’ve been put in positions where our products have been developed by men, including our undergarments and feminine products, and we really have to take charge now and start leading the industry." 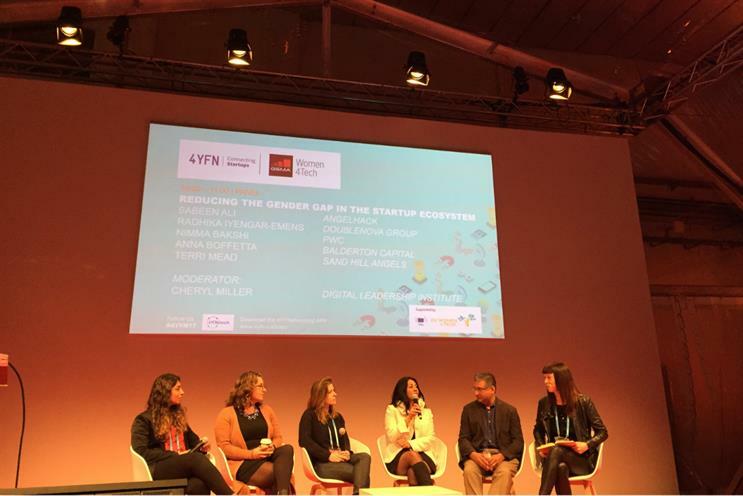 Cheryl Miller, co-founder of the Digital Leadership Institute and the moderator of the session, drew attention to the fact the session's audience was a female "ghetto" despite Mobile World Congress being dominated by male attendees. She challenged the conference organisers to put the Women4Tech panel on one of the main stages next year. Ali concluded: "You can kick and scream – but what we really need to do is speak in a way that people can hear and understand. I believe in something called the Aladdin factor, which is if you don’t ask you don’t get."